Sepakat Liner is a popular bus operator among travellers going Tioman Island. That is because they specialize in bus services between Kuala Lumpur and Tanjung Gemok, as well as Kuala Lumur and Mersing. Both Tanjung Gemok and Mersing are the gateway town to diving paradise Tioman Island. Many diving lovers always take Sepakat Liner bus from Kuala Lumpur to Tanjung Gemok before transferring to ferry service to Tioman Island. Kindly note that Tanjung Gemok is sometimes referred as Endau because Tanjung Gemok jetty is located in Endau town. Kuala Lumpur and Teluk Intan. In fact, their headquarter was previously located in Teluk Intan, Perak but now it has been moved to Kuala Lumpur. Hence, they are famous among local commuters travelling between Kuala Lumpur and Teluk Intan. Sepakat Liner operates at various convenient and easily accessible bus terminals such as Kuala Lumpur Terminal Bersepadu Selatan (TBS), Mersing Bus Terminal and Teluk Intan. Sepakat Liner is recognized as prioritizing customersâ€™ satisfaction and its serviceâ€™s quality. All the buses owned by them are equipped with spacious seating arrangement, reclining seats, and air conditioning. With its safe, comfortable and reliable bus transportation service, Sepakat Liner becomes the favourite choice among travellers going to Tioman Island from Kuala Lumpur. 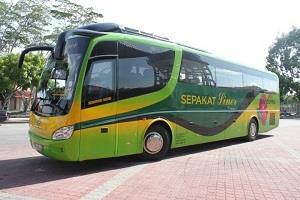 You can book Sepakat Liner bus ticket online now at BusOnlineTicket.com anytime, anyplace, and anywhere!